Peavey Electronics®, the industry's most technology-driven audio equipment manufacturer, is proud to unveil the new XR®-S mixer. Originators of the modern top box mixer, Peavey now raises the bar for compact audio solutions with this powerful new design. 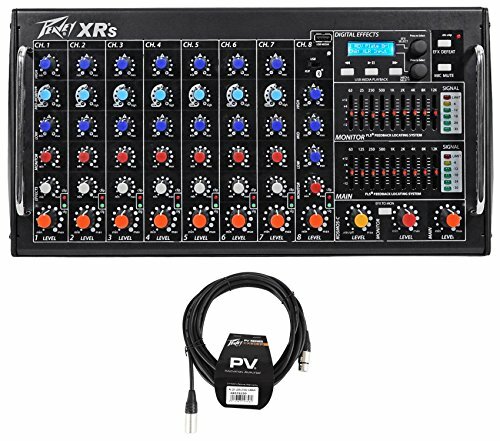 Peavey XR S 1000 Watt Rack Mountable Powered 8 Channel Mixer w/Bluetooth/USB XRS. 1,000 Watts RMS, 1500 Watts peak. Digital effects. MidMorph® EQ. Dual 9-Band Main/Mon Graphic EQ. FLS® exclusive feedback detection circuit. 3-Band EQ per channel. USB MP3 Player. 8 Combination XLR/1/4" inputs. Footswitchable master mic mute. Bluetooth® capability. Subwoofer line output. Effect to monitor return. Monitor send. Input pads. Analog record output capability. Front panel effects defeat. Footswitchable effects defeat. Individual signal and clip detection LEDs. Line level monitor output. Four twist lock outputs. Optional rack mount kit available. KOSMOS® bass enhancement. Selectable Main/Main or Main/Monitor power amp modes. Peavey PV 20' XLR Female to Male Low Z Mic Cable - 100 % Copper/Top Quality. High-quality XLR connectors with nickel contacts. High density shield for maximum flexibility and noise prevention. 24 awg. twisted pair, shielded cable. 20 foot length. Weight Unpacked: 0.75 lb(0.34 kg). Weight Packed: 0.75 lb(0.34 kg). Width Packed: 3"(7.62 cm). Height Packed: 13"(33.02 cm). Depth Packed: 0.75"(1.905 cm).